fight like hell for the living." Mary Harris was born in 1830, in County Cork, Ireland and emigrated to the US with her family in 1835. After grade school, she learned dressmaking and trained to be a teacher. She taught school in Michigan and Tennessee. She married George Jones in 1860, in Memphis, Tennessee. He was a member of the Iron Molders Union and a staunch union man. Mary’s husband and four children died of Yellow Fever in the epidemic of 1867. She later wrote, "All about my house I could hear weeping and the cries of delirium. One by one, my four little children sickened and died. I washed their little bodies and got them ready for burial. My husband caught the fever and died. I sat alone through nights of grief. No one came to me. No one could. Other homes were as stricken as was mine. All day long, all night long, I heard the grating of the wheels of the death cart." She was left alone and nearly destitute, but Mary stayed in Memphis and volunteered as a nurse until the epidemic was over. Mary moved to Chicago and opened a dress shop that was very successful. "We worked for the aristocrats of Chicago, and I had ample opportunity to observe the luxury and extravagance of their lives. Often while sewing for the lords and barons who lived in magnificence on the Lake Shore Drive, I would look out of the plate glass windows and see the poor, shivering wretches, jobless and hungry, walking along the frozen lake front. The contrast of their condition with that of the tropical comfort of the people for whom I sewed was painful to me. My employers seemed neither to notice nor to care." Mary was plunged into poverty again when she lost everything in the Great Fire of 1871. She stayed in Chicago for a couple of years after the fire and started to attend meetings of one of the earliest national labor organizations in America, called the Knights of Labor. Though Mary had lost her own family, she had adopted the workers as her family. They began to call her Mother Jones. Mother Jones had seen life from both sides and was determined to make things better for the working class. The country was undergoing a very difficult transformation from an agrarian to an industrial economy. Most workers were powerless and entirely at the mercy of their employers. They lived and worked under horrible conditions and were often paid little more than starvation wages. She knew that the only way workers could improve their lot was to band together and demand change. She began to get involved in union activities and traveled around the country to various industrial areas helping workers organize. Mother Jones was about 5 feet tall, with bright blue eyes, silver white hair, pink cheeks and wire-rimmed glasses. She wore matronly black dresses and exaggerated her age to seem more motherly. She exuded energy and enthusiasm, and was fearless, compassionate, and ambitious. She would stand up to anyone; governors, police, corporate executives, strikebreakers and armed thugs. She was denounced in the US Senate as the grandmother of all agitators, but she was a folk hero to many working-class Americans. 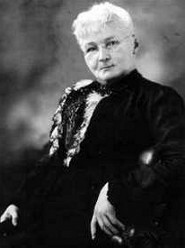 In 1877, Mother Jones was one of the leaders of a railway strike in Pittsburgh that ended in violence when the state militia fired on a crowd of men, women and children. The strike was broken, but helped to inspire future struggles. Beginning in 1890, she became involved in the fight for better wages and working conditions for mine workers. She was hired as a union organizer for the United Mine Workers in 1901 and during her time with the miner’s union, the membership grew from 10,000 members to 300,000. Self-righteous and profane, she made dramatic speeches and used flaming rhetoric. She could be a kindly grandmother one moment and quickly become a tough firebrand or feisty rabble rouser the next. Despite her diminutive appearance, Jones was feared by large corporations, newspapers and the government. During a miner’s strike in Utah, The Deseret News in Salt Lake City claimed that "…[Jones] has become a ranting vixen seeking to lead a mob of destructionists into the execution of some diabolical plot...."
Mother Jones often used street theater to attract publicity. In 1902, she led a march of miner’s wives called the "mop and broom brigade" that routed strikebreakers with brooms and mops in the Pennsylvania coal fields. In 1903, she organized and led what was called "The March of the Mill Children" from Kensington, Pennsylvania, to President Theodore Roosevelt’s home on Long Island. They wanted to bring attention to the plight of child workers in the fabric mills. Most of the children were physically stunted from the harsh working conditions and many were missing fingers that were a result of one careless moment at a weaving machine. They carried banners that said, "We want to play" and the press eagerly followed the march’s progress. When they arrived at Roosevelt’s home, he refused to meet with them, but the publicity had done it’s job. Mother said, "Our march had done it’s work. We had drawn the attention of the nation to the crime of child labor." Soon after, many states passed new child labor laws. The 1912-13 Paint Creek-Cabin Creek strike in West Virginia brought Mother Jones more national attention. During the strike, armed men employed by the mine-owners machine-gunned the strikers and their families. When a company guard was murdered in retaliation, Mother Jones was arrested and charged with conspiring to commit murder. A federal prosecutor labeled her the "most dangerous woman in America" and she was sentenced to 20 years in prison by a military judge. She contracted pneumonia while in prison and was set free by West Virginia’s governor in May, 1913. She was 83. Mother Jones was one of the leaders of a strike in Ludlow, Colorado in 1914. Workers were evicted from their company housing after they went on strike and had built a tent city on public land. 20 people were killed when the tent city was attacked and destroyed by the Colorado militia, coal company guards and scores of hired thugs. The event became known as the Ludlow Massacre. At one union meeting she was introduced as a great humanitarian. She leapt to the podium and bristled, "Get it straight. 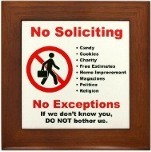 I’m not a humanitarian. I’m a hell-raiser." Whenever she spoke to the workers, she always promised to "agitate, educate and aggravate," on their behalf. 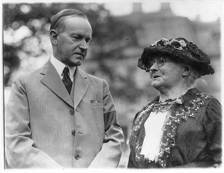 For all her radicalism in other areas, Mother Jones was opposed to giving women the right to vote, because she thought it would undermine the family. She felt that women’s traditional role as housewife and mother were much more important. "Solve the industrial problem and the men will earn enough so that women can remain home." "I have never had a vote and I have raised hell all over this country!" Her last public appearance was at her 100th birthday party in Silver Spring, Maryland, on May 1, 1930. She died soon after and was buried in the Union Miners Cemetery at Mount Olive, Illinois under a headstone with the inscription, "She gave her life to the world of labor, her blessed soul to heaven."